The executive director of the statewide inmate-advocate organization said she believes Aaron Hernandez’s death is the first reported successful suicide by an inmate hanging a sheet from a window at the maximum-security Souza-Baranowski prison, as authorities say Hernandez did. Leslie Walker, executive director of the nonprofit Prisoners’ Legal Services of Massachusetts, which serves indigent inmates, said the state had a worse-than-average inmate suicide rate a decade ago but had done some work to “suicide proof” its facilities, such as installing clothing hooks that collapse if too much weight is placed on them. Walker, from past visits to the prison, described the layout of the standard maximum-security cells there. The windows are small rectangles about three feet off the ground, and the metal frame is flush with the glass, leaving no easy way to slip a sheet through or around the metal, she said. “There is not a ledge, so I don’t think he could have jumped off the ledge. But there is a desk built into the wall close to the window,” providing a possibility, Walker said. The former Patriots star committed suicide in his cell Wednesday morning, the Department of Correction said. 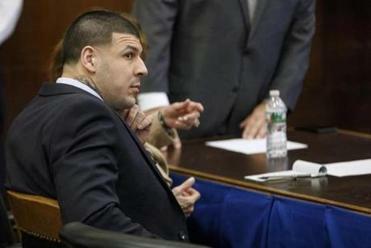 Hernandez’s lawyer said he will conduct his own investigation. At Souza-Baranowski, most inmates spend 19 hours a day in their cell, leaving for some gym time and for three weekly outdoor recreation periods in a caged deck at the end of their cell block, Walker said. Some inmates eat in a cafeteria while others “feed in block,” meaning they are brought their meals in their cells from a cart, she said. The state has four basic tiers of security for inmates: maximum, medium, minimum, and minimum/pre-release. Inmates convicted of first-degree murder, as Hernandez was in 2015, customarily begin with two years in maximum security. After that, they are eligible to move to medium security according to the state’s point-based classification system, which considers age, criminal history, prison disciplinary history, any escape history, education, and other factors — meaning Hernandez may have been eligible for a transfer soon, Walker said. As of last week, the state had 900 inmates in maximum security cells at Souza-Baranowski and 176 in maximum-security medical or support beds. John R. Ellement of the Globe staff contributed to this report. Eric Moskowitz can be reached at eric.moskowitz@globe.com. Follow him on Twitter @GlobeMoskowitz.